Our flight left 30 minutes earlier than scheduled, which is an unusual problem! 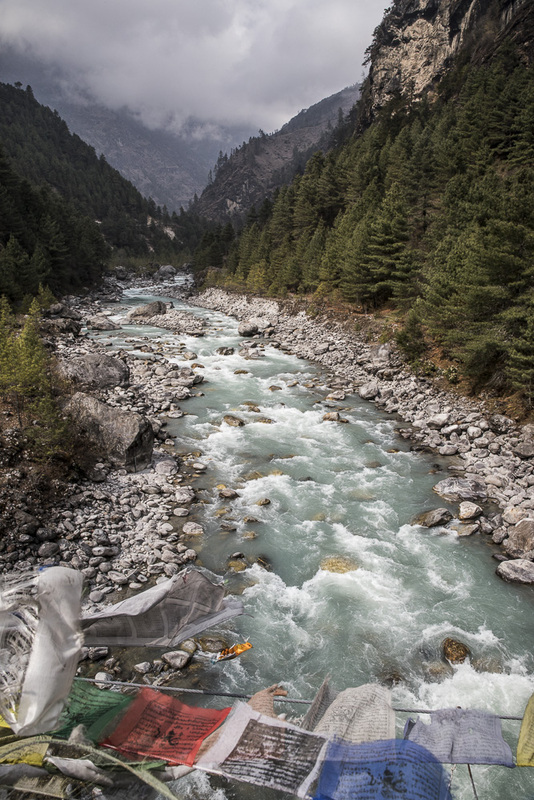 However, we were keen to get to the Himalayas as soon as possible so it was mutually beneficial. The weather in the area is such that the afternoon often becomes cloudy and then the planes cannot land so they try to leave as soon as there’s space and the plane is full. 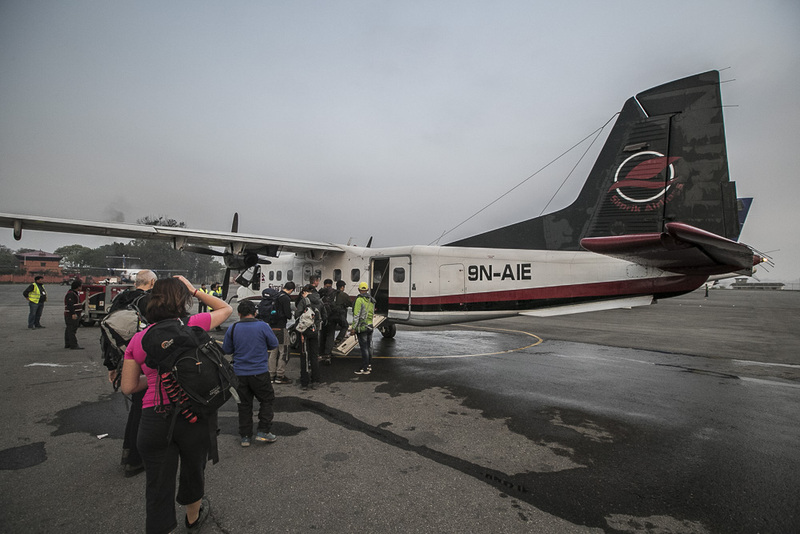 We walked out onto the tarmac and boarded the tiny plane with the 10 other passengers. Sitting cramped in the back in our emergency jumpseats next to the air stewardess, we watched as we droned past Kathmandu’s rooftops and saw the foothills change into bigger, rockier mountains. After 30 minutes, we heard the distinct sound of system alarms beeping, their panicked staccato belying the lack of obstacles ahead but within seconds a mountain loomed in front of us and we hoped this was supposed to happen. Seemingly flying straight into the mountainside, the plane suddenly lurched and did a drop landing, bumping hard onto tarmac, seconds later, we were braking and taking a sharp right turn almost simultaneously. 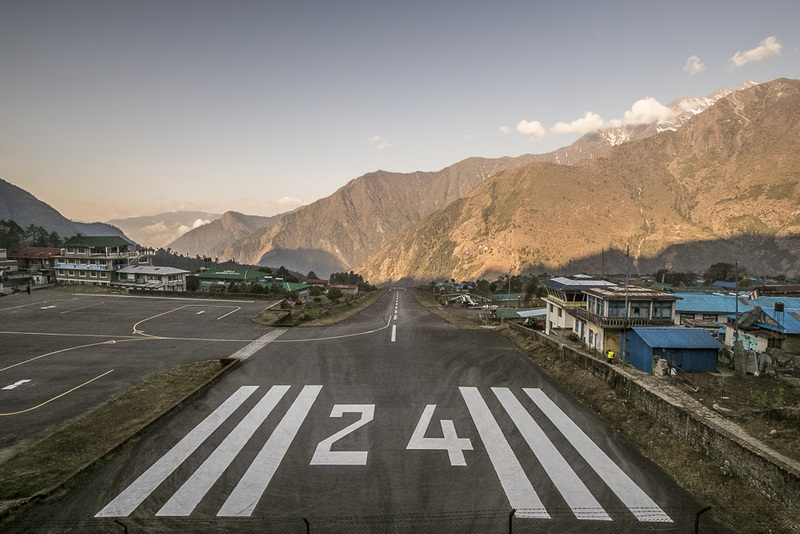 Welcome to Lukla, the world’s most dangerous airport! The runway is barely 600m long and on a slope to aid the braking of landing planes and the speed up of launching planes for take off. With this in mind, it’s easy to understand why there have been 14 crashes since 2000 at the airport (usually during take-off). Easing our cramped limbs as we rolled out of the plane, we collected our backpacks and shocked at the temperature drop, immediately put more layers on before beginning our trek! 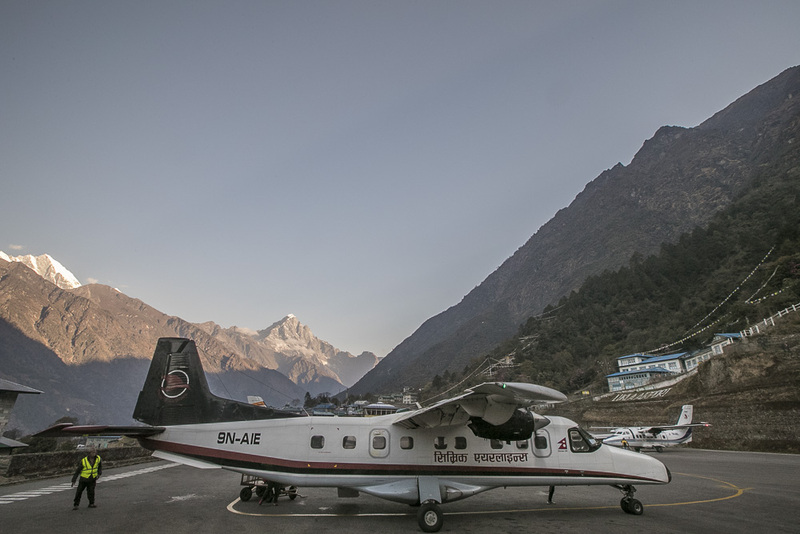 The airport arrival gate was little more than a courtyard surrounded by mesh fencing and it buzzed with the activity of sherpas and guides greeting their wards and picking up their goods. We walked the short walk out of town, the first few minutes being easy as the road is paved and stairs are well cut. The exit path of the town has a permit checking station filled with “Missing” posters of past trekkers still missing since 2010! Gentle reminders were posted everywhere on the dangers of altitude sickness and how to recognise the symptoms. We were encouraged to drink more water- about 4l a day each. Exiting the town, the trail became packed dirt and more like a hiking trail. It was a glorious morning, not too hot but still sunny and the path wound past pine trees and a vibrant blue river. It was exhilarating to breathe such fresh air after the dust of Kathmandu and to be in relative solitude after the busyness of Indian roads. We only passed a few trekkers, obviously travelling faster than us as we’d not exercised since Guatemala! 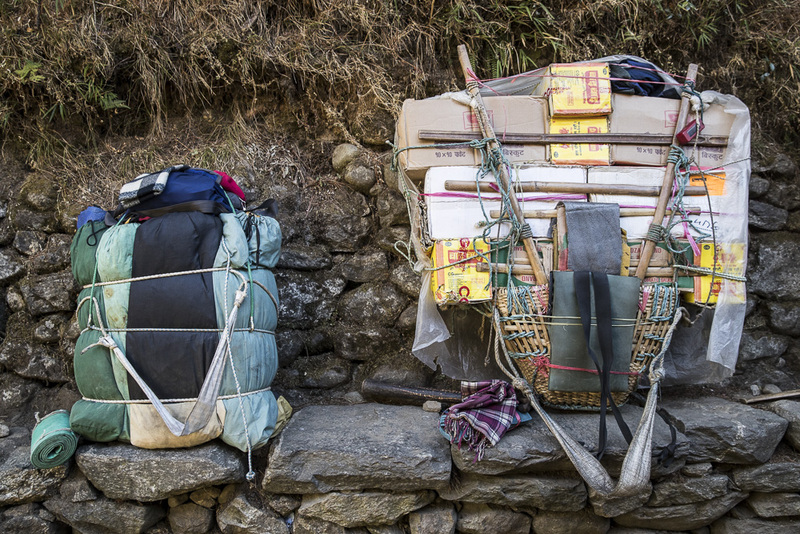 Porters would pass us at double speed despite carrying towering loads on their backs weighing about 60kg, ten times more than our efficient 6kg packs. The landscape was so breathtaking already it distracted us from the pain of walking so much although Alex’s knee gave way within the first 2 hours (the same knee she hurt when training for the South Down’s half marathon last June) and it was almost the end of the hike but the villages on the way cater for all trekkers and a knee support was surprisingly easy to find. The local cafe had water, supports, chocolate and camping equipment for sale (almost just one of each item) as an opportunist second purpose. 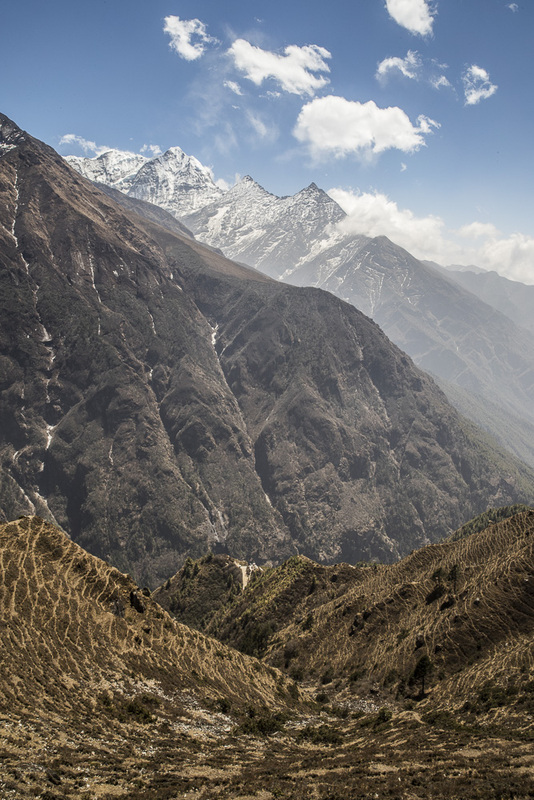 The road from Lukla to Monjo dips and rises a lot but is relatively easy walking. The overall elevation only increases a little so there is no risk of altitude sickness. However, there were loads of steep flights of stairs which burned the thighs and seemed endless. Stairs had never posed a problem before but these were extra tiring with a pack and the slight extra elevation. 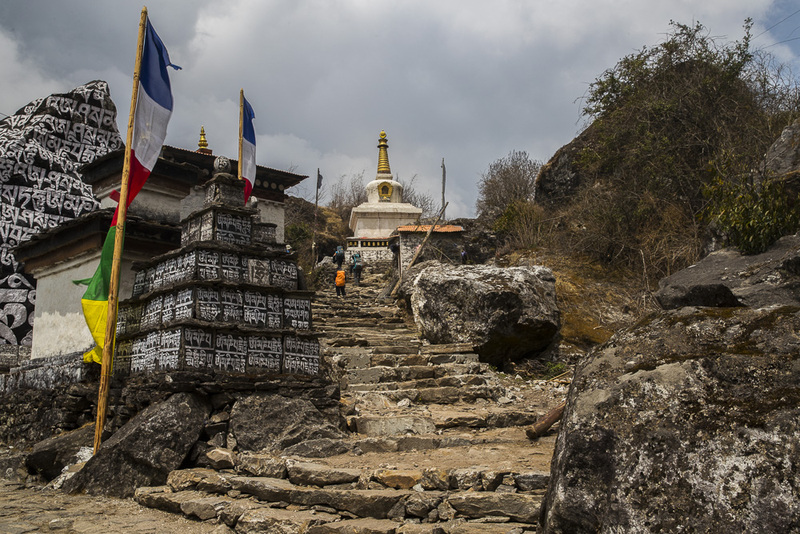 Stairs wound past Stupas, Mani stones and prayer wheels, all the while silently encouraging you along. This is considered the easy part of the trek and it was a good first day. We made friends with a lone Sherpa who was on his way to Everest Base camp (EBC) who explained he’d summited already 5 times in his life and this spring, he was going to accompany some French hopefuls who wanted to summit end of May. 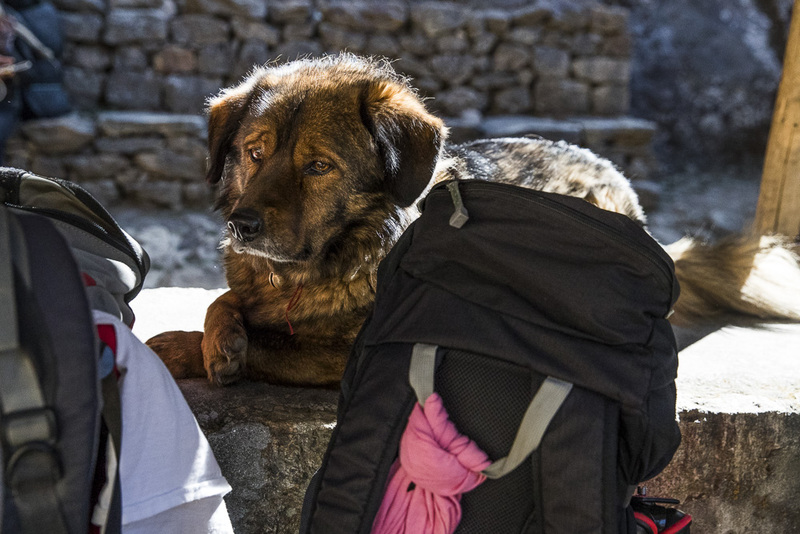 We were so taken aback at how humble he was about his achievement and how patient he was with a now limping Alex that we stuck with him until our guesthouse in Monjo- Mount Kailash Inn. This guy’s been to the summit of Everest 6 times! 6! The Inn was cosy, with two berths in a cabin room. The system works in the mountains in such a way that guests pay very little for the bed ($1 each) but are expected to buy dinner and breakfast in the Inn. Overall we paid about $12 for the two of us which included a hearty dinner of hash browns with eggs and cheese. We had been told that the staple food in the mountains was potato, cheese and meat which actually made a nice break from parathas with dahl. 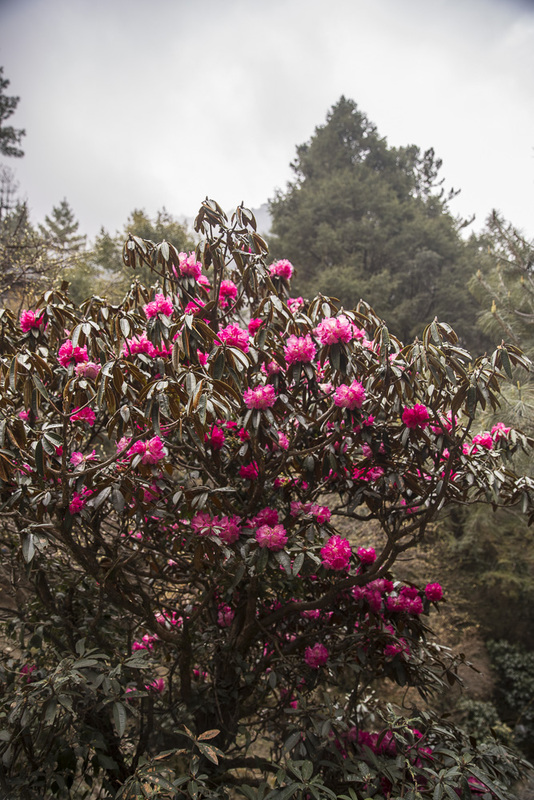 Springtime is rhododendron and magnolia flowering season so we were treated in the valley to swathes of pink and white blooms everywhere. 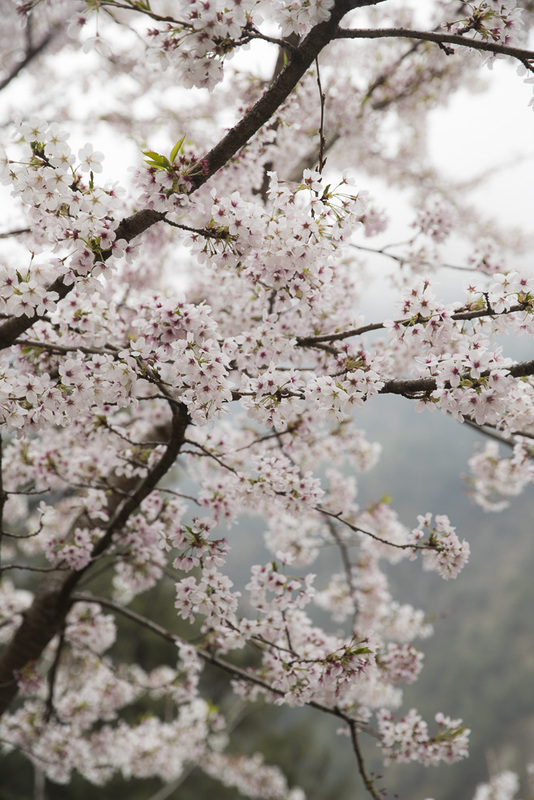 It was really beautiful and unexpected, particularly against the backdrop of snow-capped mountains. 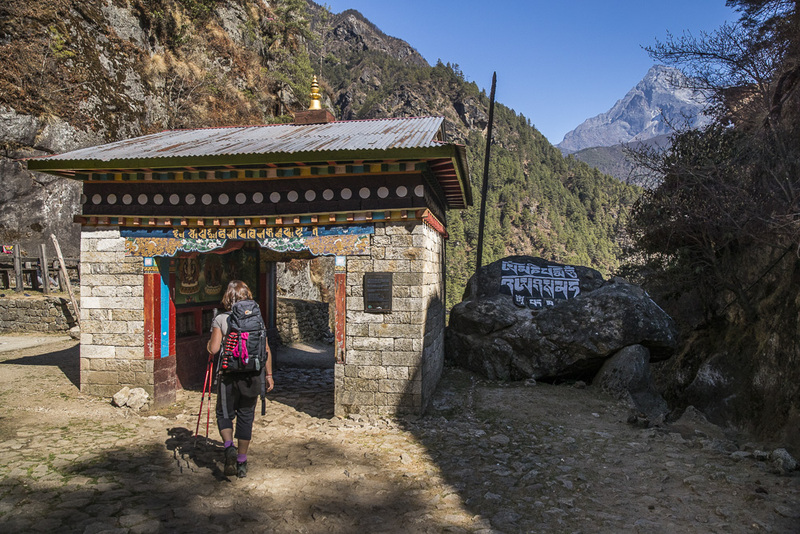 Entering the park for Khumbu region : No turning back! The descents were getting steeper and the trail became distinctly rockier, boulders along the river needed to be climbed over before the path ascended extremely swiftly and steeply. Trekkers unused to the walk would wheeze up the stairs, walking excruciatingly slow which made overtaking difficult as the passes were quite narrow. Porters and Sherpas would skip past us, oblivious to the pain that the foolish trekkers were feeling! We were astounded at some of the hopeful trekkers, clearly they’d underestimated the walk. Alex’s knee was now fine thanks to the support and the pace was OK compared to others. We finally came across the double bridges one must take to get to Namche Bazaar- the last major town before the serious trek to EBC. It indicated the last place to get provisions and to have a shower! It was an important trading town previously, Tibetans and Nepali would meet there to trade before trekking back to their home towns with new goods. After crossing the bridge, the trek gets serious, most people find this to be hardest part of the entire two week trek. The gradient is so steep and relentless that it’s almost impossible for the heart rate to stabilise even during breaks. 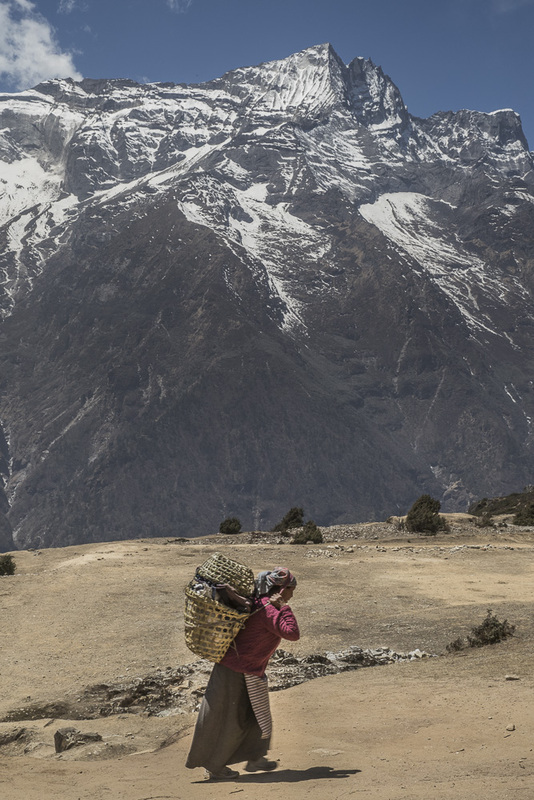 There are hardly any stops along the way to buy drinks so most trekkers are under prepared for these few kilometres. However, it’s the start of the most amazing views of the high mountains with even a glimpse of Everest at the main rest stop. After an excruciating afternoon of ascending the trail to Namche, we finally hit paved trail and found a restaurant huddled on the outskirts of town. Alex was fading fast so lunch was called with a bowl of noodle soup for Alex and more potatoes for Simon. No amount of water could quench thirst.. the posters were right about the 4l. We finally reached Namche Bazaar, a steeply constructed town on the mountain face. Streets are flights of steps to each horseshoe shaped road stretching from one side of the mountain to the other. You compete for passage with yaks and Dzis who plod their bell ringing steps up the stairs to the next feed. Completed and successful trekkers bounce down the stairs as the arrivals wheeze their way up to find a bed for the night. It’s a town full of cafes and Inns and shops, all selling last minute trekking gear and souvenirs. Alex spotted a bakery selling fresh apple pie and vowed to try it before leaving. The town is surrounded by high mountains flecked with snow and is full with friendly people. Everyone calls out “Namaste!” when you pass in the street which was so welcoming that we loved the place. 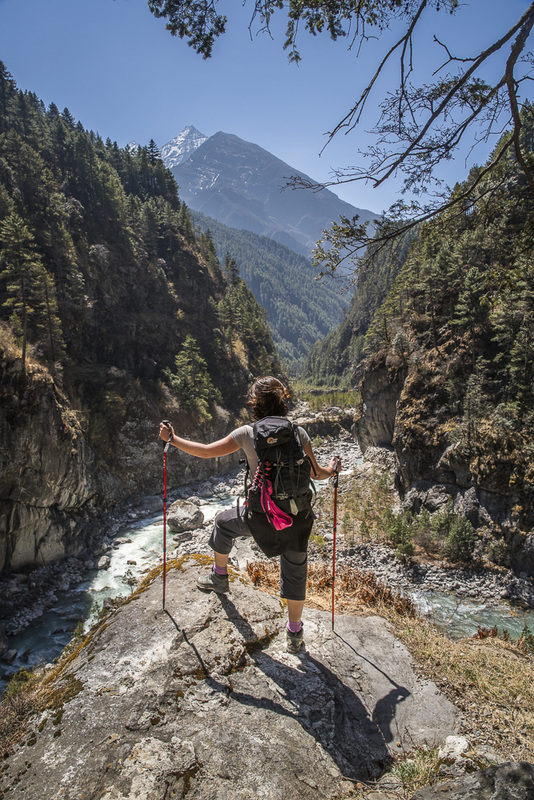 Settling down for a two day acclimatisation, we explored the surrounding area and spotted Everest again from the top of the mountain, she sat there, waiting for us to complete the next week’s trek all the way to base camp.